The Democratic National Convention is well underway in Denver, but former Senator John Edwards has gotten the DNC message, and it's "do not call." After admitting his affair with filmmaker Rielle Hunter, reports say the sullied senator has been leaving desperate voicemails for former colleagues and aides -- begging them to forgive and forget his transgression -- and his attempt to cover it up. "It was kind of pathetic, to tell you the truth," an ex-aide of Edwards told the NY Daily News about his call. According to the paper, if the aides don't ignore Edwards' requests for forgiveness, they simply tell him, "Don't call again." 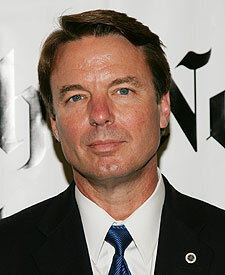 John Edwards' Alleged Love Child -- Revealed!